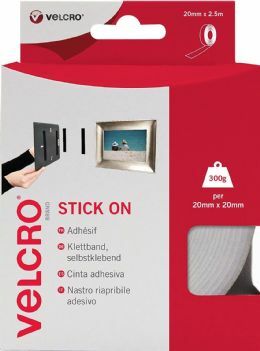 Stick On Tape is an easy alternative to nails, screws and messy glues allowing for a quick securing solution. Use to keep items tidy and secure such as small tools, notice boards, access panels, electrical appliances and much more. The product will hold up to 300 g per 20 x 20 mm hook and loop piece. To use, clean and dry both surfaces. Cut tape to length, peel backing paper and press firmly to surfaces. Allow adhesive at least 10 minutes to set before attaching hook and loop to secure the item.